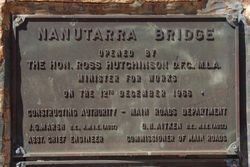 A monument commemorates the completion of the new upgraded Nanutarra bridge which replaced the existing single lane structure which was opened in 1966. 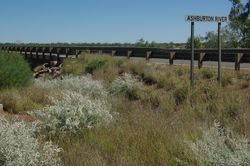 Located 100kilometres east of Onslow on the North West Coastal Highway, the Nanutarra Bridge spans the Ashburton River. The new Nanutarra Bridge is 240 metres long, consisting of 10 spans ranging from 22 to 24.5 metres in length. Park Engineers were contracted by McMahon Contractors, the bridge builders, to fabricate, supply, paint and deliver 50 steel bridge beams to be lifted into place on site. The beams ranged from 18m to 26.5m in length, each section weighing 7.5 tonnes. BlueScope Steel supplied 350 tonnes of 400 grade XLERPLATE® steel for the project. The original bridge was the only single lane bridge left on the highway. 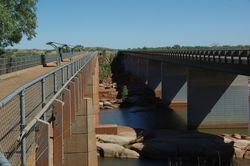 The A$9 million bridge and roadworks project expanded the bridge to two lanes, resulting in a significant improvement to safety and transport efficiency. The upgrade eliminated the need for speed and load restrictions, which had been in place since early 2003. 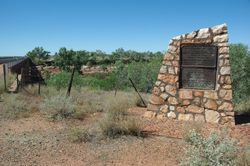 Note: This site was visited by a Voluntary Research Officer from Monument Australia in August 2015. The memorial to the new bridge is missing although it is visible on Google Earth. 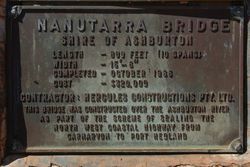 The cairn which was erected at the opening in 1966 is located at the southern end at the end of the old bridge which has been retained and now used as a footbridge.